Update: The BlackBerry Music Gateway is Now Available from ShopCrackBerry.com! A few years back, RIM introduced the BlackBerry Remote Stereo Gateway for streaming audio via Bluetooth. For whatever reason, that accessory is no longer available to purchase. Today RIM is introducing a new version of this awesome device, dubbed simply BlackBerry Music Gateway. Plan on getting your hands on this hot little device in June of this year with pricing said to be set at just $49.99. We'll have a hands on later, but for now you can find out all the details in the press release below. RIM is introducing a new accessory, the BlackBerry® Music Gateway, tonight at the BlackBerry Solutions Showcase from 6:00 – 8:00 pm in the Palms Ballroom. The new BlackBerry Music Gateway lets you wirelessly stream music to your home or car stereo from your BlackBerry® smartphone, BlackBerry® PlayBook™ tablet or any Bluetooth® enabled device*. Once connected to the BlackBerry Music Gateway, customers are able to control their music from up to 30 feet away from the stereo, without missing a single beat. Wireless Remote Control – Use your device as the remote for complete control of playback, track changes, and volume. Multitasking – Access other applications or surf the web while playing music. Music automatically pauses when an incoming phone call is received and continues when the call is ended without skipping a beat. Getting music on your BlackBerry has never been easier. Customers can sync their personal music library, purchase albums and songs from the BlackBerry Music Store or stream music from the numerous BlackBerry App World™ music apps such as BBM™ Music, Pandora or Slacker, for a rich multimedia experience. 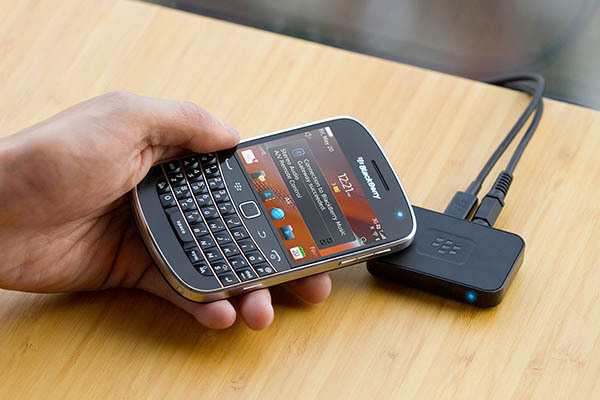 The BlackBerry Music Gateway will begin shipping in June 2012 and will be available for US$49.99. *Bluetooth enabled devices must feature the A2DP and AVRCP profiles. ** For tap to pair and connect feature, device must feature Near Field Communication (NFC).